You know what it takes to make great cheese, we know that keeping a detailed record of the process is imperative. That’s why you can now throw away the paper and go digital, thanks to our unique automated cheese make sheet. Our cheese make sheet software manages all the ingredients that go into the vat and the conditions of the make. It records and analyses conditions – from suppliers, the vat, temperatures, moisture, through to PH levels, through to blocks out and ready for storage. It automatically picks up process points in real-time, including the volume of milk in the vats, the milk density, the amount of fat within it, and checks on salt content. Ultimately, it provides you with all the information you need to compare each cheese make with the grade and quality of the end result. Our cheese make sheet software automatically picks up every stage of the process in real-time, including volume of milk in the vats, the milk density, the amount of fat within it, and checks on salt content. 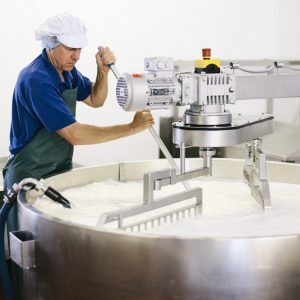 Image of a worker in cheese making factory. At a detail level, we’ve automated the process pick ups within the software. For instance, the application takes the temperature straight from the dairy system, rather than relying on someone manually reading from a dial and keying in the data; it records the temperature milk is heated to and the time before rennet is added; and it captures the elapsed time for heating before it’s moved on to the next stage of the process. And for those elements that still need to be keyed back in, we’ve built the steps into the cheese make sheet process to ensure that information is recorded in real-time rather than retrospectively. Contact us to find out more about our unique cheese make sheet software. Click on the links below to explore our software for cheese makers.